"Love the taste of Buffalo chicken wings? Try it in dip form! 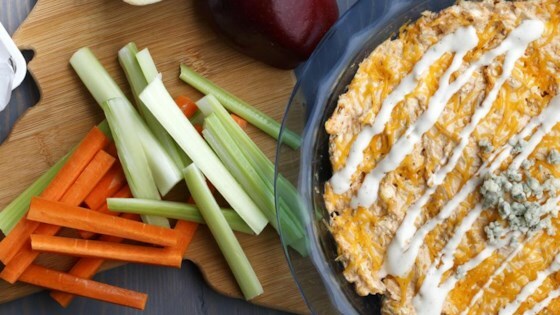 Served warm with carrots and celery sticks, this dip is loaded with chopped chicken, three types of cheese, sour cream and McCormick® Buffalo Wings Seasoning Mix  for that spicy hot sauce flavor you'll love. No matter the game score. With this dip, you'll always win." Preheat oven to 350 degrees F. Mix cream cheese, sour cream, 1/2 cup of the Cheddar cheese and Seasoning Mix in medium bowl until well blended. Stir in chicken. Spoon into lightly greased pie plate. Top with remaining 1/2 cup Cheddar cheese. Bake 20 minutes or until heated through. Sprinkle with blue cheese, if desired. Serve with assorted dippers, such as celery or carrot sticks, crackers, pita wedges or chips.